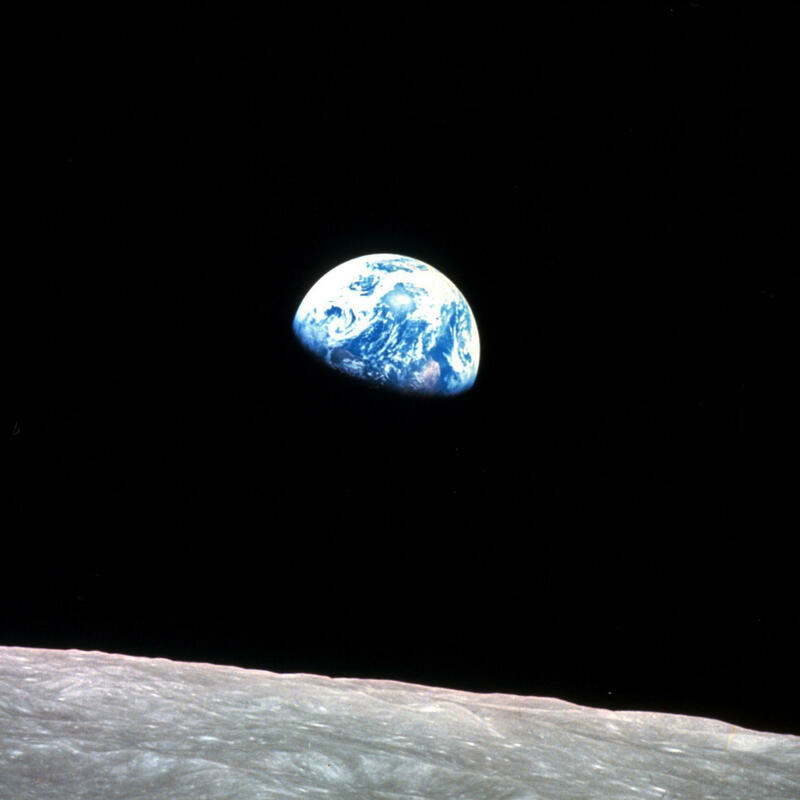 Fifty years ago today, three American astronauts read from the Book of Genesis, on Christmas Eve, as their space ship orbited the moon. The New York Times has produced two films, one short 5-minute film and one fantastic, longer 30-minute film, that remembers the iconic photo, that memorializes a stunning moment in human history. During the season of Advent, churches will read from the Gospels, directly referencing Old Testament prophecies, as being fulfilled at Christmas, with the coming of Jesus as Messiah. One of the most familiar prophecies is found in Micah 5:2, which is said to predict that the Messiah will come from Bethlehem, which is confirmed by Jesus’ birth in Bethlehem, by Matthew (Matthew 2:1-6) and Luke (Luke 2:1-7). Such prophecies can stir up controversy, even among those who claim to be Christians, as I will point out. 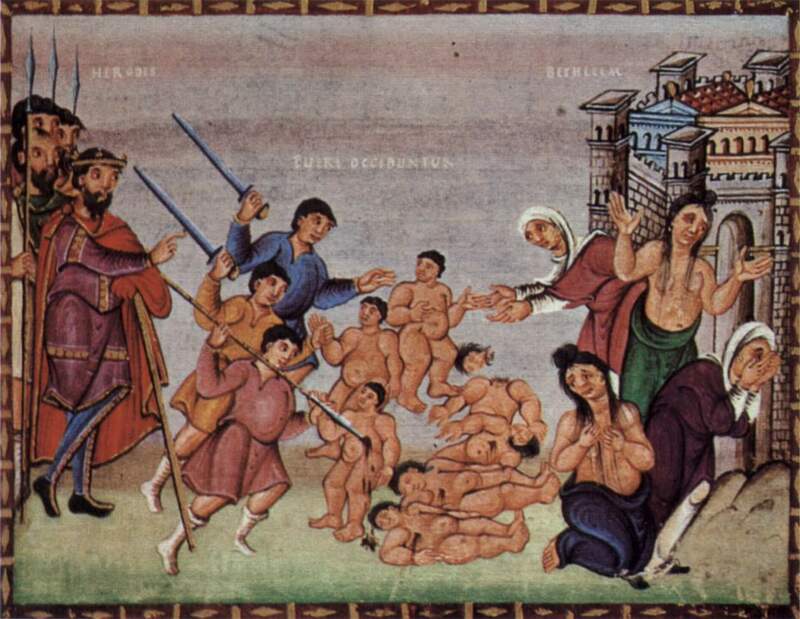 10th century image of the “Massacre of Innocents” from Matthew 2:16-18. Why would Herod take the drastic action, of murdering young children from the town of Bethlehem? The Scriptures prophesied that a descendant of King David would arise from Bethlehem, posing a threat to Herod, but a quirky dispute promoted by King-James-Only advocates only confuses the matter. Skeptics of the Christian faith will reject such predictive prophesies. For example, the well-known critic, Bart Ehrman, focuses on the problems of Jesus’ birthplace, contending that it was really Nazareth and not Bethlehem, where Jesus was born. Erhman claims that the Gospel writers invented the Bethlehem birth story to make it all fit within Micah’s prophecy. This objection has been answered elsewhere (here by apologist Tim McGrew). But there is actually another problem, brought on by misguided thinking propagated by King-James-Only advocates, that only complicates things unnecessarily. Let me first set the record straight: I do love the King James Version (KJV). Some of my friends simply prefer the KJV, and I can appreciate why. In several ways, modern translations have yet to improve upon the old trusty KJV. However, I also believe that other, more modern translations can help us to better understand God’s Word, expanding upon what the KJV gives us. “King-James-Only” advocates, on the other hand, believe that only the KJV translation can be trusted, and that all modern Bible translations are the works of the Devil. I read a great book this past summer, Mark Ward’s Authorized: The Use and Misuse of the King James Bible, that I reviewed, that gently shows why some over-enthusiastic fans of the KJV can go completely overboard. Sadly, such King-James-Only folks can ironically raise unnecessary doubts in the minds of some Christians, as to the Bible’s trustworthiness, particularly among those who are new to the faith, regardless of which translation someone uses. Here we see, in both versions, that one shall come from Bethlehem, to be ruler in Israel, which explains why Matthew and Luke have such an interest, showing that Jesus would be born in Bethlehem. Anderson’s argument is that the KJV teaches that Jesus is from “everlasting,” his “goings forth,” thus emphasizing Jesus pre-existence as a non-created being, whereas translations like the ESV, that have “ancient days,” suggest that Jesus was created in time, his “coming forth,” or “origins” (in the NIV), and therefore, is not pre-existent. In other words, please put your ESVs and NIVs in a pile and burn them, according to Anderson. But worse than that, such varied readings of Micah’s prophecy can make some think that no Bible translation can be trusted. That is; if a modern Bible translation can not be trusted, then why trust something older, like the KJV? Sadly, Anderson leaves out some really important details. First, Anderson makes it a big deal that “everlasting” is the correct translation of the Hebrew here, and not “ancient days.” However, the KJV uses the very similar term “ancient of days,” three times in the Book of Daniel to refer to God Himself. I am not aware of any King James Only advocate who would call for a rejection of the KJV, for using such terminology, “ancient of days,” to refer to the pre-existent, non-created God. If the KJV is okay with identifying “ancient of days” with God in other places, why should we be bothered here in Micah 5:2? This would indicate that Micah has in mind that the one coming from Bethlehem (v.2) is associated with the judge of Israel (v.1). This judge of Israel is thought to be the ruler of Israel, none other than a king from the line of David. Therefore, Micah has in mind that the one from Bethlehem is a son of David, an heir to the Davidic kingly throne, which chimes in with the Gospel of Luke’s insistence that Joseph, the husband of Mary, was in the line of King David (Luke 2:4 ESV). Mmmm…. So, why do “King James Only” people neglect to tell you these things? Here is some background: As Old Testament professor Claude Mariottini shows, the translation of “ancient days” ties the one coming from Bethlehem to a promise given within earthly time (Micah 7:14). Note that the covenant made with David, that there would be someone from the line of David, who would rule Israel, was made at a particular point in Israel’s history, in earthly time. In this context, there is no need to make the reference back to eternity (1 Chronicles 17:11-14). So, does this mean that the King James Version was simply wrong to translate Micah 5:2 with “from everlasting,” instead of the more modern “from ancient days?” Not necessarily. In other words, a good case can be made for both views, that Micah 5:2 refers to the Davidic covenant, established in time, and the pre-existence of the Messiah, established in eternity, that points us towards Jesus, who is not only the promised son-of-David, the king of Israel, from days of old, but also the very revelation of God, in human history, pre-existent from all eternity. So, despite the rather misguided thinking that some King James Only-ist promoters like to push, modern Bible translations can be trusted. While there are different opinions among scholars as to what constitutes the best translation, there is no conspiracy here. No, the purveyors of modern translators are not trying to deny the Trinity. Instead, they are trying to find the most accurate way of rendering the original text for the contemporary reader. A Christian may prefer the KJV. Someone else may prefer the NIV. I prefer the ESV. All of that is fine. But better yet, having access to more than one Bible translation can actually help you better understanding the full meaning of Holy Scripture. It is very easy to browse the Internet, and find plenty of King James Only websites, or YouTube channels, that try to bombard you with pious sounding arguments and half-truths, that would cause you to doubt the reliability of modern Bible translations.3 They often raise some very good points, but sadly, they rarely tell you the full story. Pinker is a brilliant cognitive psychologist, linguist, and popular science author, but apparently he needs some help with his history. 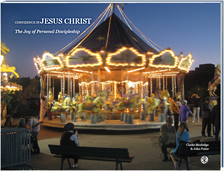 This new book by R. G. Price is hoping to popularize the notion of “Jesus Mythicism,” namely that Jesus of Nazareth never existed. Perhaps such “Jesus Myth-ers” should consider taking a trip to Rome, and dig a little through history. 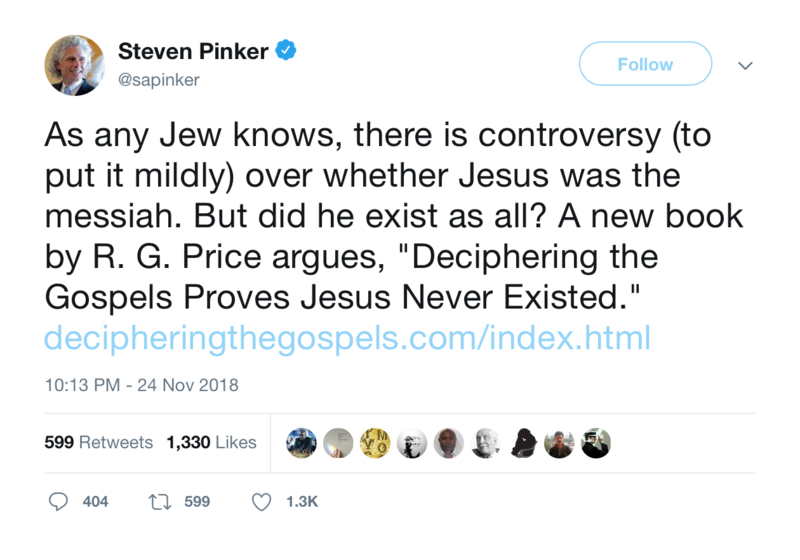 This idea that Jesus never existed has really taken off over the past few years, picking up a lot of intrigued interest among atheists, that apparently now includes Steven Pinker, even as early as two years ago! If professor Pinker has no opportunity to go to Rome anytime soon, say in time for Christmas, he might want to consider reading material from Tim O’Neill, a fellow atheist, who gets his history right, as discussed months ago here at Veracity. The details are too much to go into here, but O’Neill’s series on “Jesus Mythicism” is simply fantastic, where he basically argues that “Jesus Mythicism” is roughly the atheist equivalent of the belief in a “Flat Earth,” being promoted by some conservative Christians. I guess we all have our embarrassing, crazy family members to deal with at holiday family gatherings. 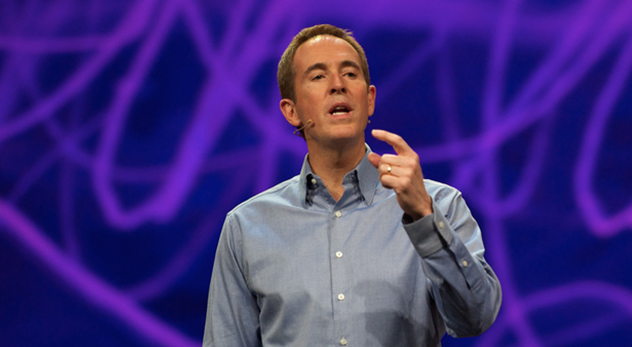 Price’s self-published book is a revisionist reading of the Gospels, but “Jesus Myth-ers” more commonly make a different, yet just as historically convoluted, argument. Long time Veracity readers would know that those who promote “Jesus Mythicism” often say that Christianity stole much of its belief system from the Roman cult of worshipping Mithras, popular among Roman soldiers during the first centuries of the Christian era. For example, “Jesus Myth-ers” typically contend that the Christian claim, of Jesus being “born of a virgin,” at Christmas, was actually taken from the Mithraic religion, which supposedly claimed that Mithras was also “born of a virgin,” on December 25th. Tim O’Neill has a great (yet long) post about the cult of Mithras, that should effectively dismantle such spurious claims (O’Neill has another great post that critiques R. G. Price’s own, even more peculiar version of “Jesus Mythicism,” that does not address the Mithras religion). The evidence to support the claim, that Mithras was “born of a virgin” on December 25th, is either non-existent or terribly “stupid” at best (“stupid” is how Price’s “fellow” atheist, Tim O’Neill, describes it!). 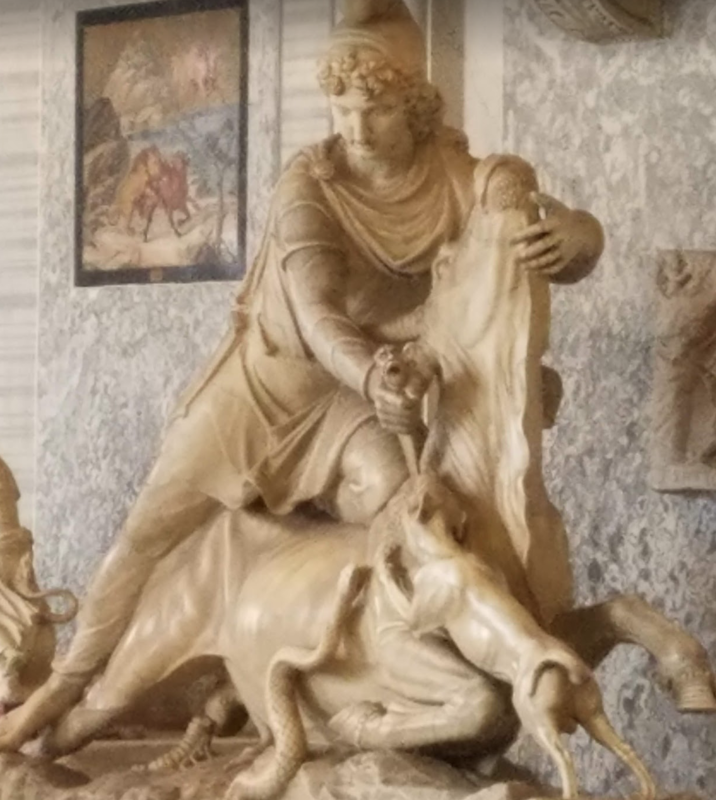 So, when my wife and I had the opportunity to go visit Rome earlier this year, I was determined to find out more about Mithras myself…. just to make sure. 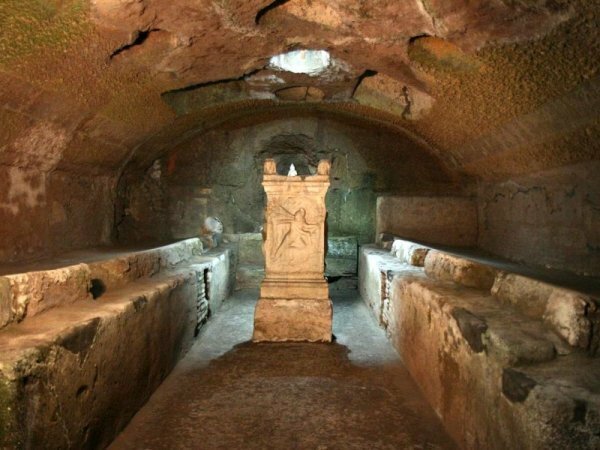 The Mithras cult was a big deal in ancient Rome, and there are several places in Rome where archaeologists have found Mithraic temples buried well below buildings from the later Christian era. The closest modern equivalent to Mithraism might be the Masonic movement. Imagine a fraternity of like-minded, Roman soldiers coming together to perform sacred rituals, with all of their secret handshakes, and whatnot. Tours to see the archaeological remains of these Mithraic temples were hard to get, as the spaces to get into these underground areas were pretty tight. 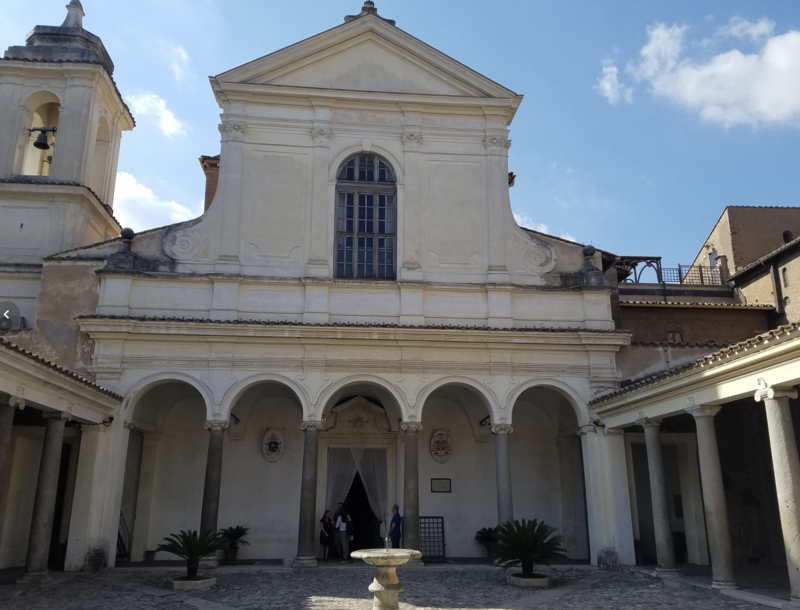 Thankfully, we were able to go to the Basilica of San Clemente, a church in the Lateran part of Rome, which has a unique, multi-layered architecture. At the main entrance (see photo below), of the church, you enter the main sanctuary, built in the 11th century. 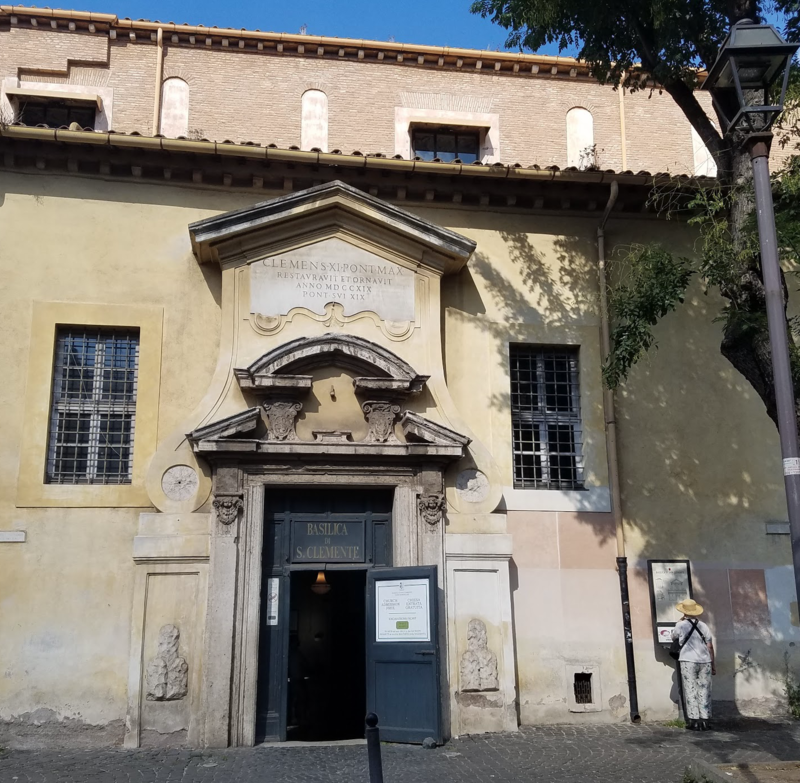 Entrance to the Basilica of San Clemente, in Rome, Italy (my wife has her back to me, as she is reading the entrance sign to the far right of the door). Below that level is a 4th century church, which itself was built out of a home temporarily used for Christian worship, dating back to the 1st century. In the basement of this home, was a Mithraic temple, that was in use briefly in the 2nd century A.D. Basement Mithraic temple, underneath the Basilica of San Clemente (from the church guidebook). Note the relief image of Mithras stabbing the cosmic bull, on the altar. Once you do a little “digging” (pun intended! ), you get the idea that far from being a copycat faith that stole from Mithraism, Christianity is actually quite different. Neither Mithraism nor Christianity lines up anything like what the “Jesus Myth-ers” imagine them to be. Sure, the fact that Mithraism and Christianity are very different, does not necessarily mean that Christianity is true. A strong consensus of scholars is convinced that Jesus indeed did exist, even if many of these scholars reject the idea of God becoming Incarnate at Christmas. There are atheists, like Stephen Pinker, R. G. Price, and the more historically astute, Tim O’Neill, who do not “buy into” the Christian claim of Jesus being risen from the dead. I pray that God might touch their hearts and minds in a manner that they might see the Risen Jesus clearly. But at the very least, the trip to Rome that my wife and I took helps to confirm that when someone says “Merry Christmas,” it is not just a clever way of saying “Merry Mithras” instead. Listen to Nick Peters’ Deeper Water’s apologetics podcast, where Nick interviews Tim O’Neill discussing Jesus’ Mythicism. Tim O’Neill wrote a short review of Steven Pinker’s 2011 best-selling book, Better Angels of Our Nature, that should cause any Pinker enthusiast to pause. Steven Pinker and Nick Spencer debate one another, on the Unbelievable podcast, hosted by Justin Brierley, earlier in 2018, on the topic, “Have Science, Reason and Humanism Replaced Faith? (Youtube)” New Testament scholar N.T. Wright responds to Steven Pinker’s claim, that human rights were not derived from Christianity (Youtube).